Do you have a hard time coming up with new ideas? Do you wonder how you can be more creative? If your answers are yes, join Silvertrain for a fun workshop that will give you new tools and tricks. 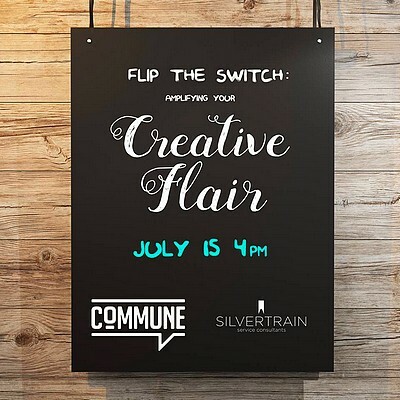 Enjoy exploring your creativity at the Flip The Switch: Amplifying Your Creative Flair workshop at Commune on July 15, 4 p.m. The door fee is P300, inclusive of a regular-sized espresso-based drink, hot tea, or house blend iced tea, and a light snack. Slots are limited. To sign up, e-mail inigo@commune.ph or havecoffee@commune.ph, or call 275-6324 or 0919-859-5848.